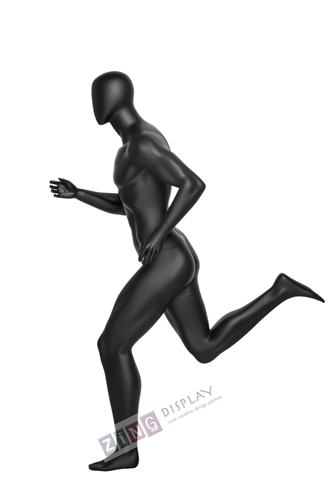 Male Runner Sport Series Mannequin. Add motion to your active wear display. Show clothing the way they are used In Action! Matte black finish with abstract egghead. Fiberglass construction with glass base and calf support included. Male Runner in full stride for your sporting displays. Show clothing the way they are used In Action! Dress in track gear, athletic shoes, etc. to show the full sport in action affect.